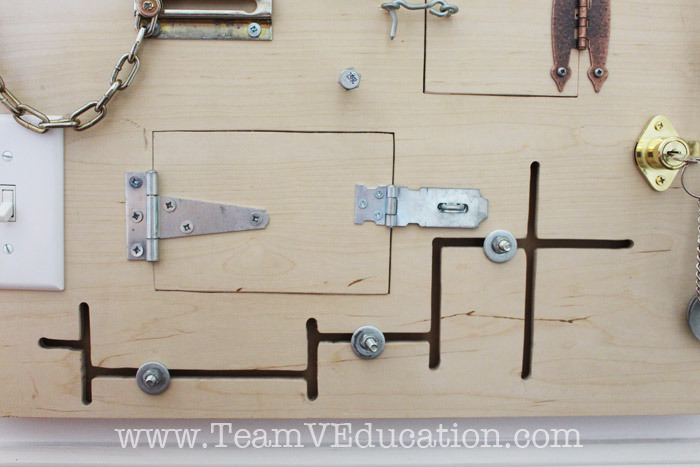 A DIY Busy Board is a great way to introduce children to the art of tinkering. 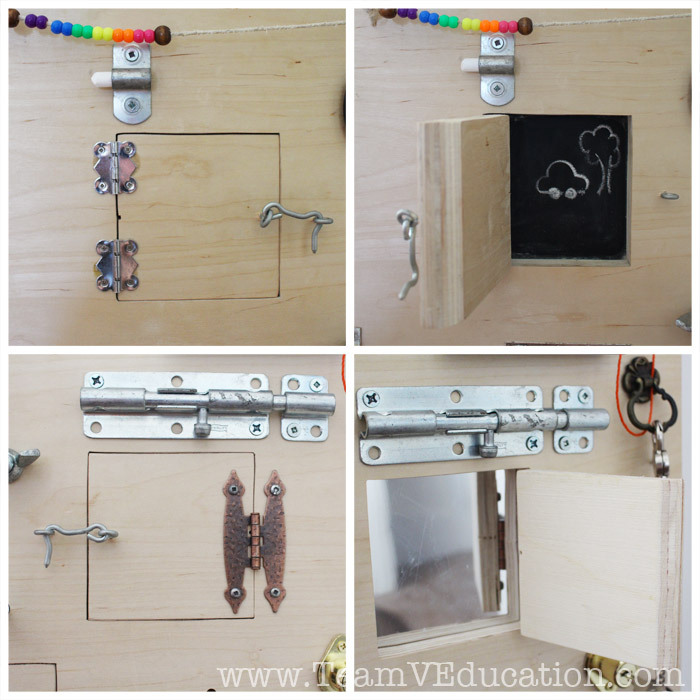 With peek-a-boo doors, latches, locks, and more, this do-it-yourself gift is perfect for busy little hands. Read on to see how it’s done! As creative educators, we are continually searching for ideas that interest our children, capture their attentions, and meet their individual needs and curiosities. Having journeyed through toddlerhood now three times, we are finally recognizing that less is more, toys are not entirely necessary, and that these toddlers sure love to tinker! For example, for this upcoming Christmas, we were asked what our current toddler (the third to join “Team V,” and soon to be followed by his younger brother) would love as a gift. Toys? Until recently, he has hardly engaged in any sort of toy-related activity. Clothes? No thank you, hand-me-downs are treating us just fine. Treats? Not unless you can package up a box of apples for us! We are singing a different tune these days. Many of the ‘educational’ (i.e. battery operated) toys that were gifted earlier in our parenting years have since been donated. Creative wooden blocks and various animals from our favourite “Toobs” collections have taken their place. (We are especially fans of the Dinos and believe it or not, Trees Toobs)! Instead of toys, how about a couch? Could we perhaps be gifted a designated ‘jumping couch’ or a mini trampoline? Or maybe consider an indoor climber to weather the storms of winter? A box of random kitchen tools, or a stack of used paper to strew across the living room floor; these all seem like developmentally appropriate gifts for an exploring toddler! We have become big advocates for open-ended play, developing gross-motor skills, and providing ample opportunities to explore their surroundings. They have tucked themselves away into little cubbies and hidden corners, calling them “forts.” They have flopped, dropped, and rolled on pillows across the floor, and have clambered all over Daddy, treating him as a human jungle gym. It never ceases to amaze me that a pile of toys can be gifted with the greatest of intentions, and yet, it is my stack of mixing bowls that sees the most action. (Read: open the cupboard, empty every bowl onto the floor, and then lose interest until mommy tidies up the mess for round two). When Pinterest was first introduced years ago and I jumped onto the beta version bandwagon, I was instantly drawn to all toys handmade. I wanted to recreate each and every one of them! More specifically, I wanted my husband to recreate them. Even more specifically, I wanted a homemade activity board for our busy toddler! 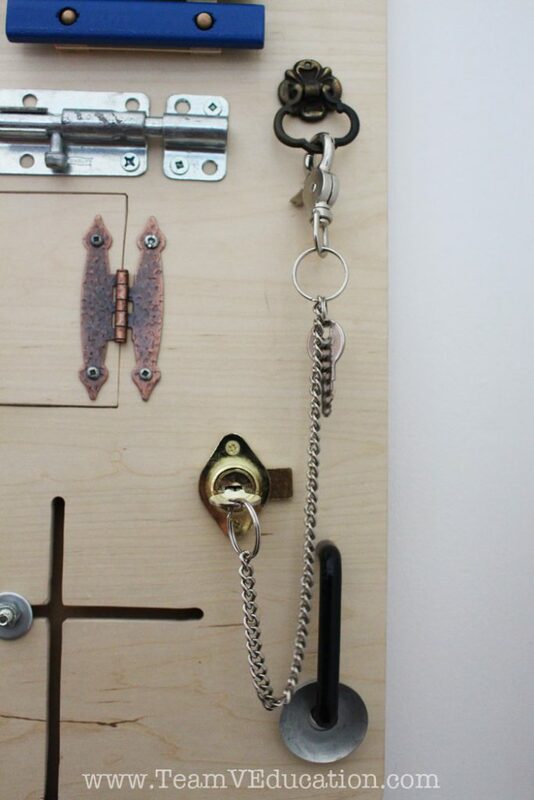 A sensory board is a beautiful collaboration of knobs, switches, and keys. Remember to add in several random items for flare and intrigue, and a family photo for personalization. 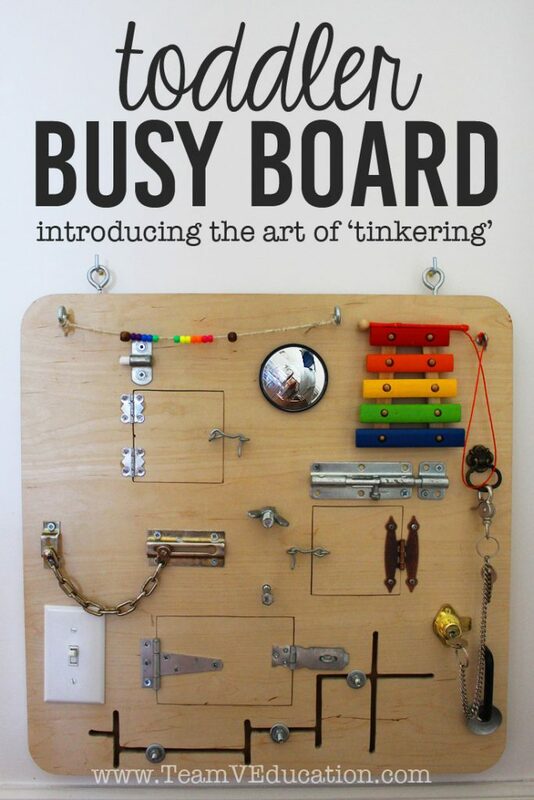 The toddler “busy board” or “activity board” is born: a simple collection of everyday ‘tools’ that provides ample opportunities to tinker! This has been the one ‘toy’ that has stood the test of time in our home. 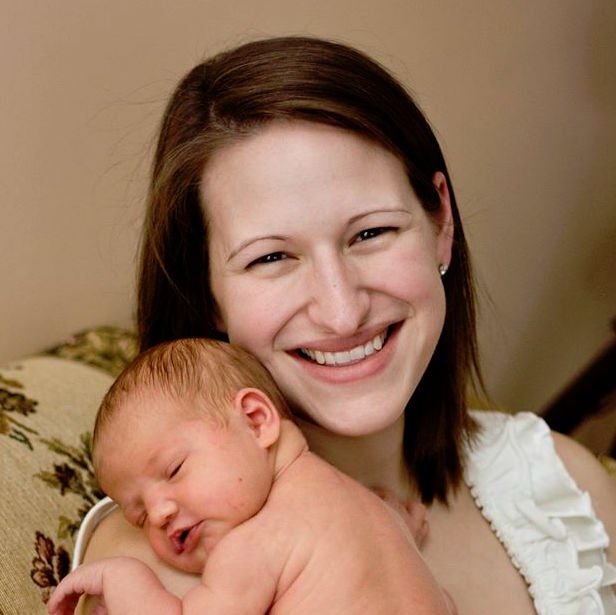 Visiting children gravitate to it, and each and every one of our babies to toddle around our home has opened the family photo door to point and exclaim with joy their discovery of smiling faces they can recognize! The DIY busy board for babies and toddlers is so much more than just keeping busy. It is a thoughtful creation for inquisitive babes. 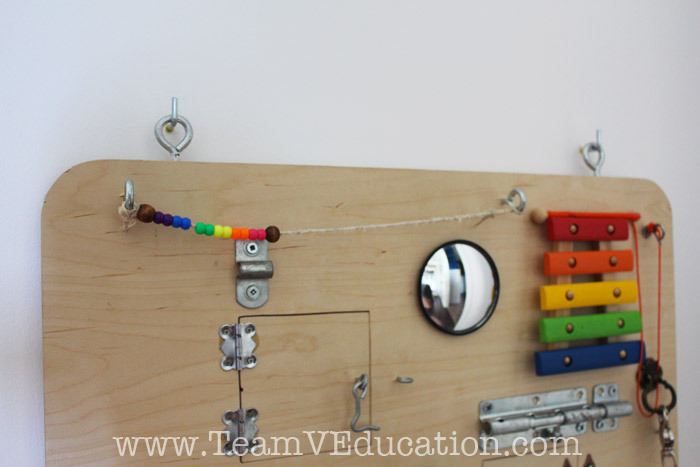 This sensory board is a fun and simple way to encourage early tinkering. It truly is a beautiful addition to any home that houses an exploring toddler. While there are many options available to purchase ready-made busy boards, creating your own is a special experience. The majority of our board is made of ‘lost and found’ items from our garage. Both my husband and father-in-law keep on hand random latches, hinges, and all sizes of nuts and bolts for those ‘just in case’ moments. We were able to gather everything we needed simply by looking through our stash. A nice sheet of plywood, some careful ‘tinkering’ as I like to call it, and my husband had crafted this gorgeous DIY Busy Board for our soon-to-be one-year-old and all of the babies that have followed! Give it a try yourself. 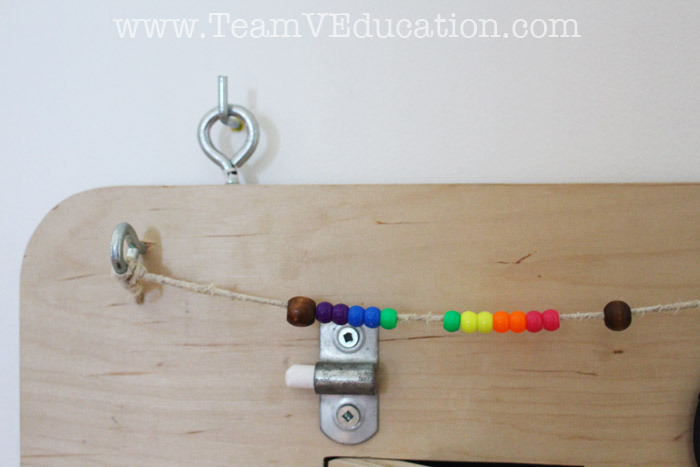 Gather some simple objects that your toddler would enjoy tinkering with, and create a board of your own. And if you have any suggestions of other items to add, please comment below! We love to hear from our readers and fellow creative educators. Something made from nothing! How does it get better than that? A busy board for inquisitive minds and little eager hands. Thank you! It was definitely fun to put this together. My toddler is 2.5 yr old….can such an activity board useful fr her too…?? From our own experience, children aged 1-3 enjoy these sensory boards the most. I encourage you to choose items that you feel will benefit your toddler. Perhaps buckles, zippers, buttons, snaps, etc. 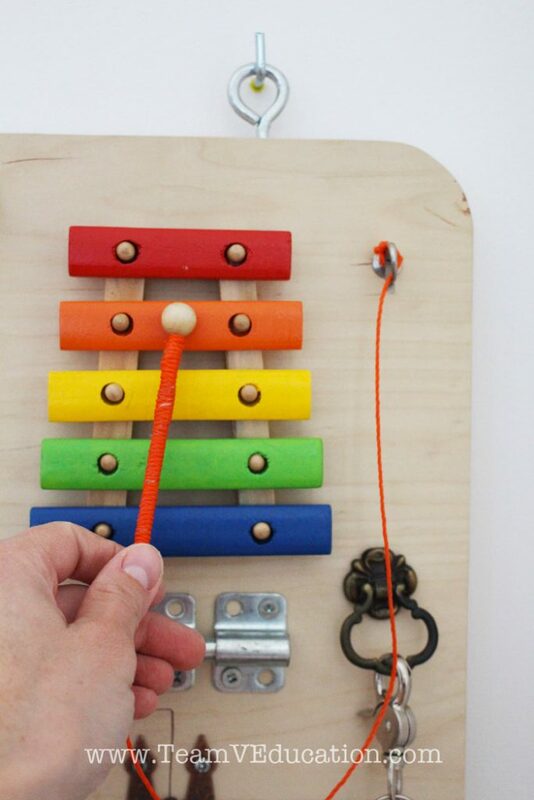 would support her fine motor skills and provide a fun way for her to practice these skills! About how much did this cost to make? I really want to make one for my almost 15 month old! This is a difficult question for us to answer since most of the items we included were free from around our home. I encourage you to start by asking friends, family and neighbours for random hardware that they have laying around the home. Small pieces of plywood can easily be purchased from the Home Depot. By starting with what you have (consider a zipper cut from an old sweater!) you can keep the cost down significantly. Let us know how it goes for you!